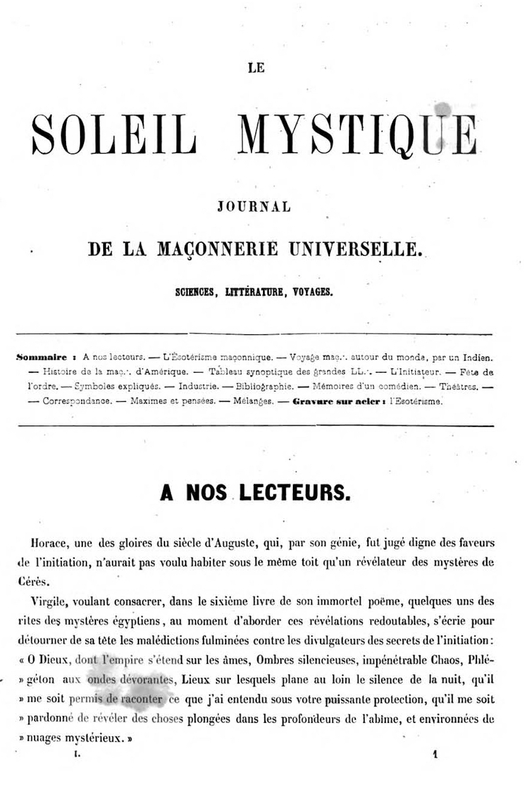 Journal de la Maconnerie universelle: Sciences, litterature, voyages. This is a Masonic journal but is included here because of the role that J.-E. Marconis (or Marconis de Negre) played in the spread of the Rite of Memphis, around which John Yarker, Theodor Reuss, Papus (Gerard Encausse), et al. built their all-encompassing occult schemes. The journal devoted itself to what it called "Maconnerie occulte" which "had as its goal initiation into the sciences which were secretly practiced in the Egyptian sanctuaries." Marconis was not named as the editor but appears as contributor of "L'Esoterisme maconnique," "L'Initiateur," and other articles. He had earlier helped edit Le Vengeur. On him see the note under Temple Mystique. BNF.